Harmony Design is not yet well-known outside Sweden, though the name may be familiar to regular readers of TNT-Audio through Lucio Cadeddu's enthusiastic review of their fine D/A converter, the Harmony Design DA-9. The small company began 11 years ago when Mattias Stridbeck began doing modifications to CD players and amplifiers. 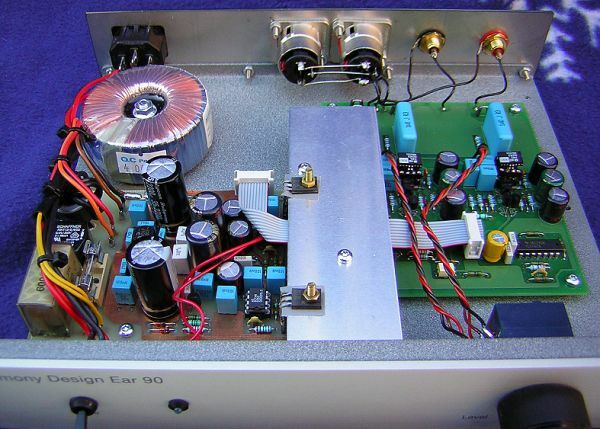 His first complete product was the custom, handbuilt Pre 906 preamp (first on sale in December 1996). This was followed by the DA9 DAC in 1996/7 and the Pre 9 (a more affordable version of the Pre 906) between 1999 and 2001. In late 2001 the Ear 90 appeared and it has since become Harmony Design's best-selling product, receiving very good reviews in Sweden's two Hi-Fi magazines. With this completion of Harmony Design's product line, the company now focuses entirely on manufacturing, developing and selling their own products. This is very much a personal business. Nearly all the parts used in the Harmony Design products are manufactured locally in Gothenburg, and the products are assembled, tested and packed in Mattias' own home. This home-based Hi-Fi business is part of his family tradition: his father runs a respected small business in Gothenburg, manufacturing quality loudspeakers (see www.stridbeck.com). You might wonder how such small manufacturers can compete with global multinationals and Chinese companies in the areas of price and quality... the encouraging answer is: very well, as far as Harmony Design is concerned. First there is the rare satisfaction of using a product that has been personally designed and tested by the manufacturer. Then there is the fact that the Ear 90 has the simple elegant design that you would expect of a Swedish product. The amp comes in black or silver versions. The review sample was the silver one (really more matt grey in colour) with an elegant brushed aluminium fascia. Inside there is the same evidence of quality: high grade components and careful construction. The Harmony Design website reports that it has "a potent power supply for maximum stability and disturbance suppression, [a] powerful output stage that drives the headphones directly without limiting impedance links, contacts from Neutrik [and] active DC protection on the output". This is a product built to last. One proof of this is that the review sample was not sent in very secure packaging and a small ding in the left back corner of the tough aluminium case showed that it had had a rough journey through the post. However, this did not damage or loosen any of the interior components, and the amp worked fine straight out of the box. Harmony Design has already said that they are going to strengthen their packing for international posting, and will naturally exchange any items which are damaged in the delivery process. The review unit was sent without a standard IEC power cable, but I was able to source one locally without difficulty. As Lucio points out in his article on the DA9, this feature means that higher quality power cables can easily be used. The front just has an on/off switch, blue power LED and a volume control. The pot is a good quality Alps unit. At the back are the IEC power socket, two headphone outputs and, for this unbalanced inputs version, one set of RCA inputs. I'm not sure about the need for a twin set of headphone outputs--how often do two people listen to music on headphones together? On the other hand, the product would be much improved by having two sets of inputs. I found it a nuisance to have to plug and unplug inputs to switch between my CD player and my phono stage. As my ears are not perfectly matched, I would also like to have the option of a balance control, perhaps one that could be bypassed. Of course, these would all add to the cost. Straight out of the box, and listening through my 30 year old Sennheiser HD414s, I was disappointed. There was very little of the reported 14db amplification, and the sound was muddy. I soon realised that this amp was not suited for the ultra-high-impedance of these old classics. Life got busy and I had to set aside the review for a couple of months. I listened to the amp occasionally with the 414s, but without much pleasure. Then I wrote to Mattias to ask what headphones he recommended for this amp. He replied that it is intended to work with audiophile quality phones such as the Sennheiser HD600 or HD650s. I finally decided on mid-price Sennheiser HD497s with 32ohm impedance, as these matched Harmony's published specs and I wanted some low impedance phones for a future T-Amp headphone test. With the new phones I heard the clarity and detail that I had been expecting, but I was still not as thrilled as I had hoped. This high quality amp was Harmony Design's best-seller, so what was I missing? 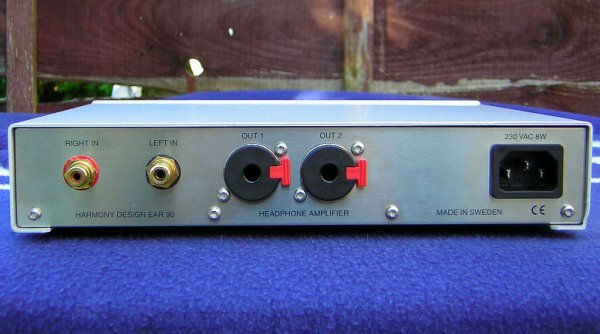 The first thing I needed to recognise is that this is still a solid-state headphone amp. As I listen mainly to valve-amplification, I have become less accustomed to the sound of solid state, and the sound of headphones. So, I had to remind myself that the clean, but shut-in, sound that I was hearing could be enjoyable on its own terms. Secondly, and much more importantly, I needed to give the phones and the amp more time to run in. Mattias recommends at least a week to burn in the amp and reports that some customers reported that it needed at least five. I agree with them. Time went on. In February, the patient Mattias wrote to me offering to send me the new op-amps which he uses in his upgraded version. These, he said, would give the amp a softer and more detailed sound. In March a small package arrived with two new opamps. I removed the two existing opamps with care and plugged in the replacements. This is a very easy upgrade which existing owners could do at home, as long as they take care to match the markings on the opamps, sockets and pcbs correctly. This change in opamps made quite a difference to the sound. As promised it became softer, sweeter and more detailed. This sound is not better than before, just different. After living with the new opamps for most of the review period, I put the original opamps back and found the bright, tighter sound also good fun, particularly for rock music. So, as Lucio suggests in his review of the DA9, there is scope for experimenting and tweaking here too. Despite the differences in sound between the two opamps, the Ear 90 still presents sound in a neutral way. Whether you find this cool or just right is a matter of taste. As this review suggests, I found that it took me quite a long time to get used its sound, but I now find it quite satisfying. I would like to have its neutral presentation available to me as a permanent point of reference! I suspect that classical music lovers will particularly appreciate this. Those who want to boogie may still wish to compare it with amps with a different character (I hope to do a similar test on the World Audio Design's ECL83-based Headphone II amplifier when WAD can supply a review sample). This amp is certainly worth hearing. I tested it with two quite different CD players and with my resident Shure V15IV, SME Series II, Garrard 301 and GramAmp 2 combo, and it revealed the difference between these sources clearly, letting through more of the music through than I have heard previously via headphones before. It is absolutely silent in operation. There is no hum. In fact, listening to a live comedy record (Kenneth Williams' "The Best of Rambling Syd Rumpo"), I could hear the slight hum from the live amplification in the original performance instead! As customers who don't live near a Swedish distributor will have to place an order without being able to listen first, it is good to know that Harmony Design is willing to offer a 14 day trial to customers who request this. Naturally, units returned after a trial should be in the same condition they were sent--each one counts for a small manufacturer. 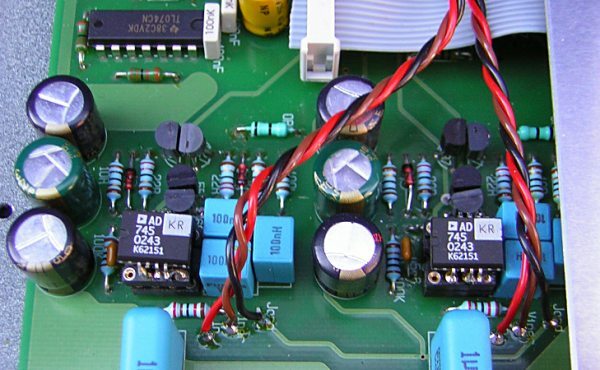 Remember that the manufacturer can customise some aspects of this amp, such as the amplification level you need, and you can experiment with it yourself later. 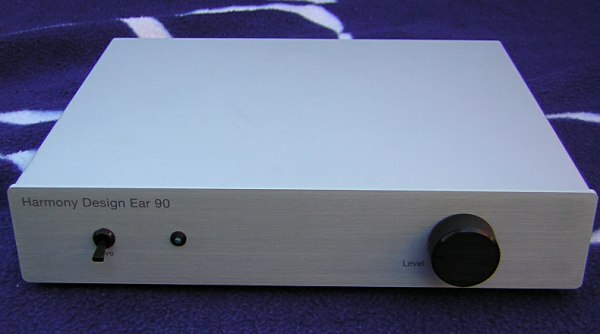 Those looking for a high quality solid state headphone amplifier with a neutral character should give the Ear90 a try. It could meet your personal listening needs for a long time, because it will reward any upgrades to your sources and headphones that you make in the future.